So this Christmas I was very lucky and honored to have spent time with Drew and his family. His parents were generous enough to give us a kitchenaid stand mixer as our Christmas present. I all but jumped for joy, reliving that feeling you get as a child when you open the big Christmas present. This thing is massive, a 5.5 qt professional mixer in red, even a few days later I can't help but stare at it on the counter. I premiered the mixer by making whipped potatoes for Christmas dinner which went over well, everyone loved them. Basically hot boiled potatoes, butter, sour cream, milk and garlic whipped up with the paddle attachment. Yesterday, since I had more time I decided to make a first attempt at baking a loaf of bread. For this I used a basic bread dough recipe of 4 cups of bread flour, 1.5 cups water, 1 tsp dry active yeast and two tsp salt. To this I added 2 tsp of olive oil and a few cloves of garlic to give the bread some added flavor. I added all these ingredients at once to the mixer, making sure the yeast dissolved into the water. Using the hook attachment I mixed all the ingredients together for a good 15 minutes until the dough formed into a smooth ball. I let the dough rise for about an hour until it doubled in size. I then took the dough and kneaded a bit to take out some gas and redistribute the yeast. I rolled the dough into a boule and placed it into an enameled dutch oven that was brushed with olive oil. I got the idea to use the dutch oven from reading Ratio: The Simple Codes Behind the Craft of Everday Cooking by Michael Ruhlman. In it he explains that baking in a dutch oven with the lid on allows for steam to circulate and makes for a perfect bread crust. I let the dough proof in the dutch oven for another hour and a half before baking. Before placing in the oven cut a few slits on the top of the bread, brushed with olive oil and sprinkled with salt. I also decided to place a few cloves of garlic into the slits I cut out so they can roast into the bread. I placed the lid on the dutch oven and placed in a preheated 450 degree oven and baked covered for a half hour, then removed the lid and baked for another 15 minutes or so. Once out of the oven the crust on the bread was perfect. 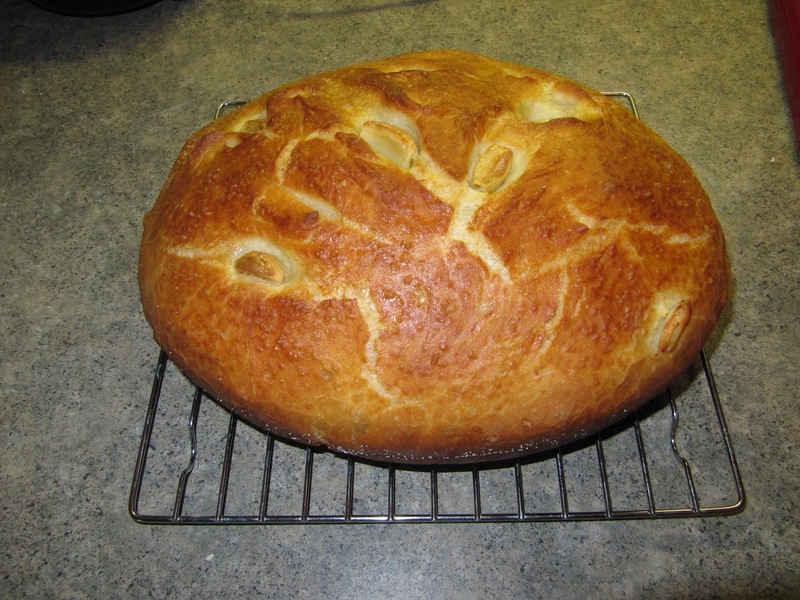 The bread fell right out of the dutch oven and was ready to serve. The bread was delicious and I was very excited about how easy it was to make. We ate the bread as is, just warm out of the oven without any butter, there is something quite enjoyable about basic warm bread. This will definitely be my go to recipe for breadmaking, give it a try! In a large mixing bowl combine all the ingredients, making sure that the yeast dissolves into the water. Using a bread hook attachment combine all the ingredients and continue knead for about 15 minutes until a smooth ball forms and there is a good amount of elasticity in the dough. Remove the hook and leave the dough in the mixing bowl, allowing it to rise until about double the size. Move the dough to a clean lightly floured surface and knead by hand for a minute or two just to redistribute the yeast. 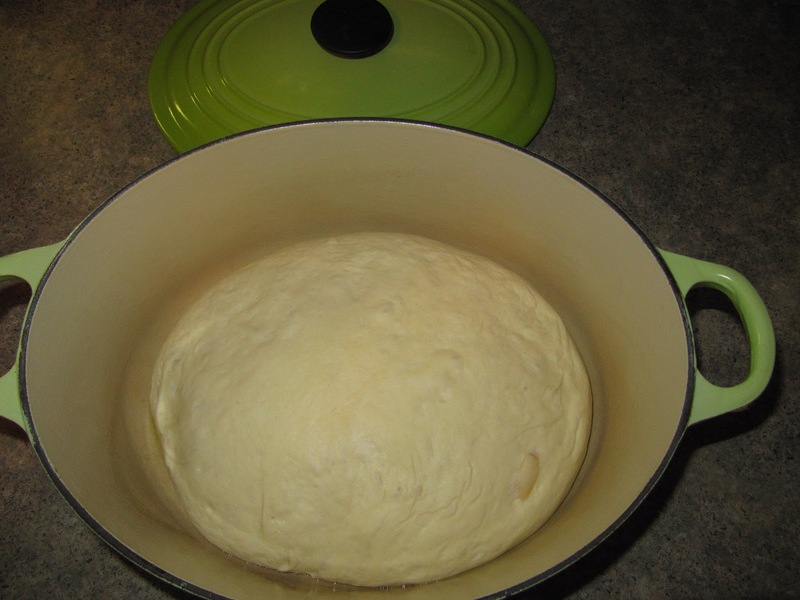 Roll the dough into a ball and placed in a 7.5 qt dutch oven that has been brushed with olive oil, cover with a cloth and allow to proof for at least an hour at room temperature. Preheat oven to 450 degrees. Place the dutch oven with lid on into the oven for about 30 minutes then remove the lid and continue to bake for another 15 - 20 minutes, the crust will brown up quickly so the timing depends on your oven. Remove from the oven and enjoy hot delicious bread. Hi there, it's Jason from www.seejasoncook.com - thanks for following my blog! 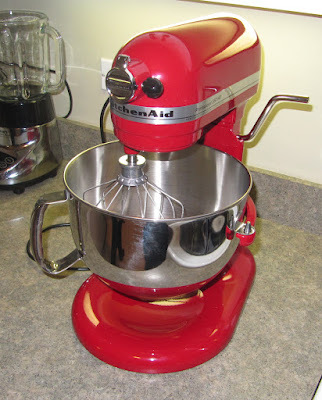 I love the mixer, I got the same one for Christmas and I am loving it too!! (OK, I admit... I got it for myself.) I know exactly what you mean about not getting to update as often as you'd like; I'm going to try hard to make myself post regular updates but it can be hard to find the time and energy! Keep up the good work and I'll be talking to ya!